We may not be runaway leaders in league 2 but as Stefeno said, we are just a win away from winning this league and with the only two teams that can catch us, Swindon and Swansea playing each other next, we may not even need that! Plymouth's problems are well documented and they also sit bottom of the totesport league. However, they last played on 19 March with their next match on 5 April so maybe a fair few of the first team may get a run out - could be worth going to watch? As our season enters the last lap you could argue either that an extra match could result in an avoidable injury to a player or gets the squad players up to speed to enter the fray. The players that didn't start on Friday are: Potter, Ellis, LRT, Kee, Macklin, Halpin, Oastler, Stevens, Yeoman. (Murray on international duty and Palmer out on loan?) It is not actually a bad team with seven making first team starts this season. However, at least two youth team players will be necessary to make numbers up unless some of the Friday starters, start. Note: Kick off 2p.m. at Home Park. i may be able to get to this one, is it at home park & pay on the gate. if so any idea's how much? Yep, it is at home park, £4 for adults and £2 for children. There’s something rather illicit about midweek afternoon reserve games which are made for feckless, heavily-unionised, public sector loony lefty types such as myself. Haven’t we got anything better to do with our lives? And, of the several dozen souls who were at Home Park this afternoon, I’d guess getting on for half were Torquay fans. Full report on the official site detailing how we won 5-1 to “clinch” (if that isn’t too excitable a word) the reserve league title. Well done to all for making watching the reserve side such an entertaining experience this season. Argyle fielded a slightly stronger side than they’d done against Exeter and Buckland. Rather more quality on the pitch this time, but still pretty youthful and no real first-teamers other than the curious Mr Walton. Argyle scored first through South Devon boy Liam Head with Lloyd Macklin equalising after being judged onside. A good even first-half in a typically open, but not exactly pugnacious, reserve league game. Given the strength of our line-up I’d expected slightly more in the first-half but no real complaints about what was on offer for my £4. A straight swap at half-time at right-back – Scott Taylor for Joe Parrish (who both looked pretty decent) – and we upped the gear from then on. Tactically I’d say it was pretty close to 4-4-2 (in old money) with Stevens, Yeoman, Macklin and Spear taking turns to pair Kee upfront. Oastler took the centre of midfield until dropping to centre-back when TJ Lang went off injured. In midfield – and on the flanks – there was a fair amount of shuffling between Yeoman, Macklin, Stevens and Spear which proved too much for Argyle. Ray Spear impressed me more-and-more as the game progressed. The importance of clinching the title in our first season back in reserve footie shouldn`t go without real praise to all connected with the club who have made it possible, the coaches and of course the players. Bucks has pushed for a winning mentality in the club and a set up to support the first team and now we have a trophy as a reward for the courage shown by the board. I hope the players and staff get the recognition they deserve. maybe not on saturday because nothing should distract from the business of setting about getting 3 pts. But certainly at some point before we shut up shop for the summer there should be a piece in the programme and the trophy paraded at the ground. This achievement is something to be proud of and not looked upon as being insignificant. We have beaten clubs who really should have a far superior set up to ours. One piece of news gleaned from today's visit to Plymouth - in case you missed it - was that Chris Hargreaves made his debut for Argyle Legends against Elburton Veterans on Sunday. 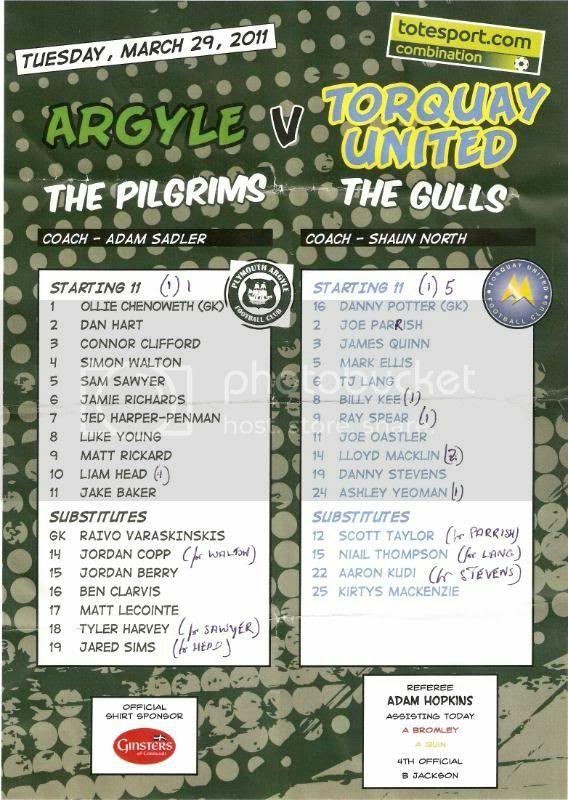 Other TUFC "names" in the side included Tommy Tynan - bloody hell, he's my age - Darren Garner (who probably looks almost as old as Tynan) and Mark Rowe (who played a few games during the dark ages of the mid 1980s). Has anyone worked out what the table will look like when Argyle are wound up and points from their games removed from the table? With that little caveat, well done lads!